After a failed attempt spanning several months to sell his bachelor pad via a pocket listing, meaning it doesn’t show up in real estate documents, Kanye West has officially put it on the market. According to TMZ, Kanye West is selling his three bedroom, four bathroom home, located low in the Hollywood Hills area of Los Angeles, for $3.3 million. The house’s eye-popping décor is an homage to kitsch pop culture, with artworks of iconic American family The Jetsons adorning the walls, giant Toy Story figurines, Andy Warhol “Campbell’s Soup Can” paintings, and huge piles of stuffed animals. Built on spec, the 4,200-square-foot, three-level house started out as a beige stucco monolith which the rapper transformed with the help of interior designer Don Stewart over three years “into a cross between a museum and a Louis Vuitton boutique”. Kanye West bought it in 2003 for $1,750,000, and the house is decked out with a ceiling mural in the dining room and French walnut floors. But it is not the first time Kanye West has attempted to sell the house, and he first listed the property in 2010 for $3.995 million. 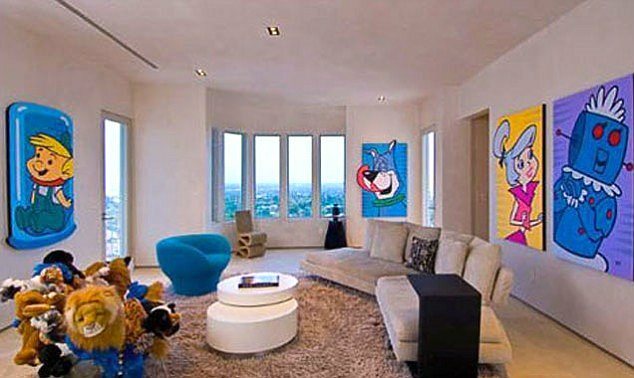 After installing walnut flooring, and opening up the space for a loft-like feel, Kanye West commissioned a series of six Jetsons “portraits”, to accompany the game room’s chair of stuffed animals by Fernando and Humberto Campana and a Smurf-blue Igloo chair by Eero Koivisto. The guest room has its own Jetsons-esque touch: a 1970’s desk in white acrylic, reflecting pink from a fuchsia silk-screen Marilyn behind. However, Kanye West saved the real glamour for his master bedroom. The suite features an Antonio Citterio bed draped with red-fox and chinchilla throws. And as you would expect of self-professed fashionista, Kanye West’s closet could compete with Anna Wintour’s with 8-feet-high sliding racks for almost 200 pairs of trainers. Burglars broke into the house in June of last year while Kanye West was in England performing with Jay-Z. Kim Kardashian and Kanye West are currently renovating the $11 million Bel Air home they purchased earlier this year, which will be their first love nest together. They have both quietly put their LA homes on the market amid speculation they are moving in together. Kim Kardashian has pocket listed her $4.8 million Beverly Hills home – which she bought in 2010 – with an asking price of $5 million.